Cork flooring can produce a pleasant and comfortable walking surface. Cork flooring is a great choice for play areas or commercial spaces where there is a desire for a comfortable walking and standing surface. Suberin, a natural substance in cork, works as a mold inhibitor and prevents cork flooring from rotting, besides that it has natural insulation properties that can help reduce heating costs. Cork floors are naturally fire resistant and don't release any toxic gasses or chemicals when burned accidentally. It can be a very durable material if properly maintained. In North America, one big setback about cork flooring is its place of origin: Europe. Cork flooring is not an expensive material and sometimes can be as cheap as $1.10 per square feet, but as high as $7.25, depending on the characteristics and color of the material. 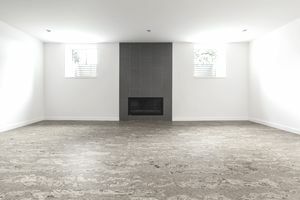 The cost can also vary depending on the warranty offered by the manufacturer and the insulation and soundproofing characteristics of the flooring material. Ideally, the builder cost of installing this type of floor will be around $4 to $8 per square feet, still way below that of a hardwood flooring system. The installation cost should be equal to or less than $1 per square foot if you can to be competitive. When installing cork flooring, remember to leave a 1/2 inch around the flooring perimeter so it can expand and contract appropriately. Once all the planks have been installed apply a polyurethane protection coat so it can last longer. Not all planks will be of the same color, so open them and try matching them according to their color for a more balanced flooring pattern. Check the floor before starting the installation. It should be at flat as possible with a maximum of 1/8inch variation, otherwise concrete or leveling should be applied. Cork flooring is a very good and reliable product that could be used in areas around the house and office space but stay away from areas where the cork flooring will be in contact with water. Don't worry about scratches; they will become part of the material pattern. Cork flooring systems can offer you some great benefits, but there are also some limitations to its use. Some additions to cork flooring can result in a less than eco-friendly product. There's a limited palette of colors to choose from. It must be sealed every five years to keep its waterproof characteristics. It can be stained by oil, dirt, and spills if not properly protected, so it is not the best floor to have in a kitchen. If you are remodeling a kitchen, it will be ideal if you install the cabinets first and then the cork, as the weight of the cabinets can eventually create dents in the cork. Carbon emissions during cork transportation can offset other benefits. Sharp objects can puncture or damage cork flooring surfaces. Costs are higher than traditional flooring materials.